13 km. 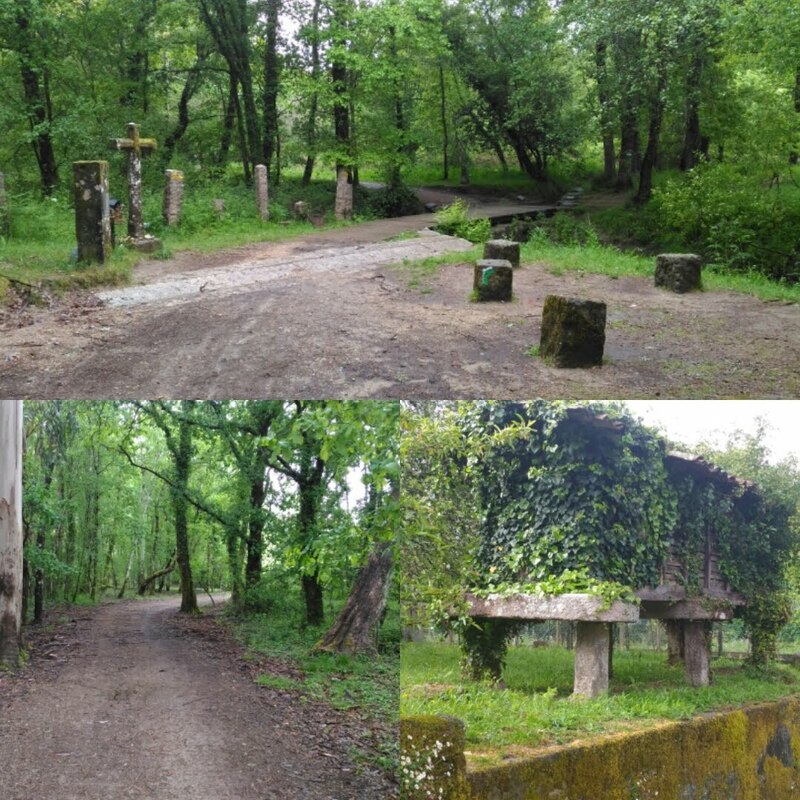 Still a few km of nice walking. Arriving at the cathedral before 11 am after second cup of coffee/cake. 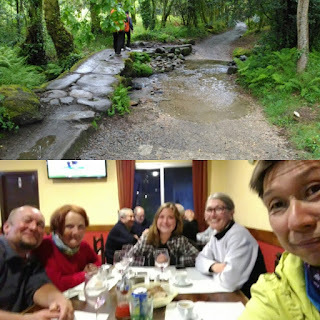 Walked most of the way with Beate (Poland) I met yesterday at Teo. The new pilgrim office I hate, security check outside and an hour queue before getting my compostela. 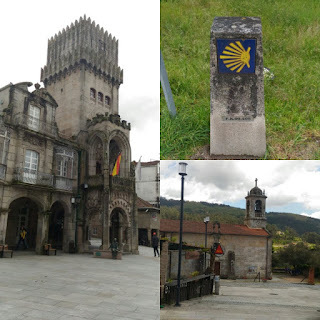 I will forgo the compostela and also the wait if it wasn't that a few years ago they change the design of the compostela. I may as well collect this new design. This is getting too commercial. The compostela is free but if you want to add the route and total km where you start it is 3 extra euros for another certificate. Forget it. The outside of the cathedral is very clean after the renovation. Preferred the dirty look. Also the Portico of Glory is closed for renovation. I get to say hi to Jimmy (St James) and also for all that asked me to hug his statue for them. Not sure if the botafumeiro (the huge incense ball) will be swinging for the mass later. Already seen it so can skipped that. Of course things are overpriced here at the destination. As I won't be staying overnight I need to leave my backpack (they don't allow pilgrims to carry their backpack into the cathedral anymore). There seems to be more and more restrictions over the years. It's 2.5 euros for backpack storage. Not that I have a choice as I have a overnight bus to Madrid and don't want to carry the backpack everywhere. It's 1.2 km to the bus station to buy the tickets. That will be an additional 3.6 km (to, back and to again) today. Oliver did an over 40 km yesterday to Santiago and is there to greet me today. 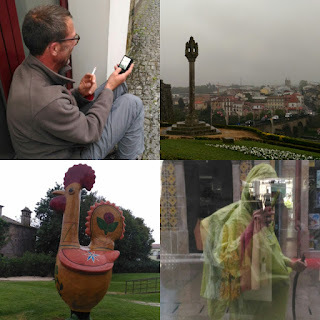 He left on the bus to Finisterre so we said our goodbyes. Both mother and child from Denmark and Germany arrives also today. Aurelius from Brazil too. He celebrates his birthday tomorrow, I apologize I won't be there. 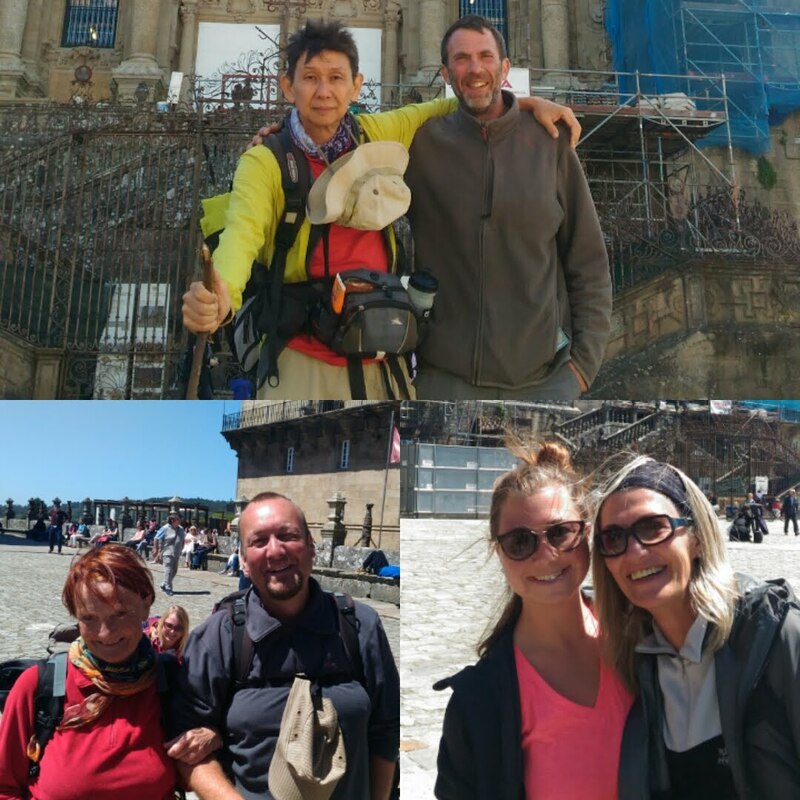 You bump into people all the time in Santiago, those you met along the way. Finally it's 23 days and 650 km? 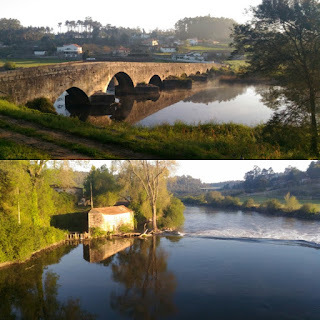 Lisbon to Santiago de Compostela on the Camino Portuguese. Memories and new families that I may get to see again in the future. Not sure if there will be another Camino soon. If so, the blog will be alive again. 23 km today. Cold and cloudy but no rain. All three layers the whole day. 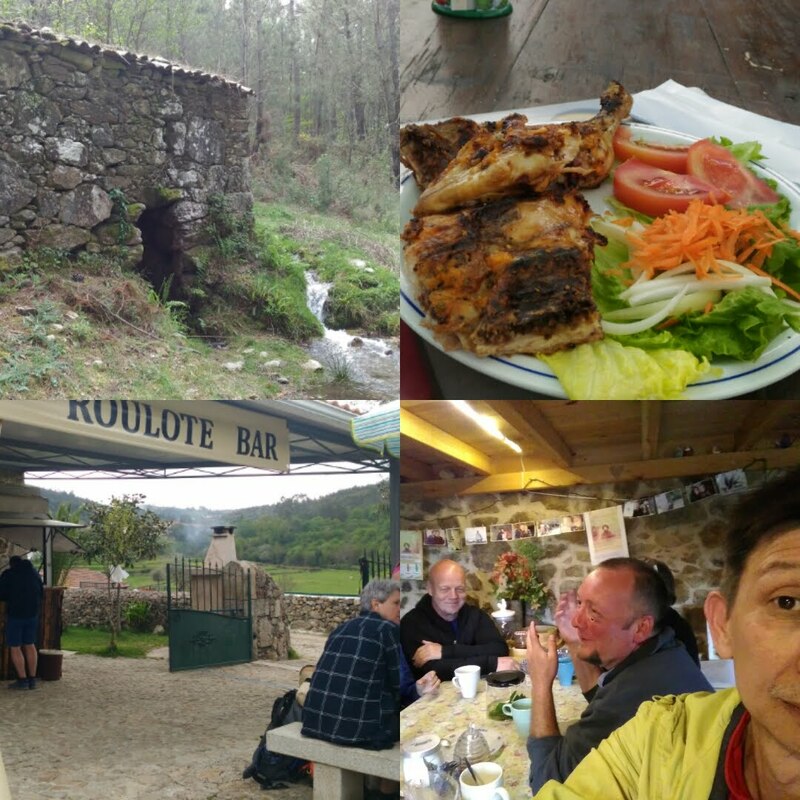 Right now at the 13 km mark in a private albergue, 12 euros and you pay for all other drinks and food. 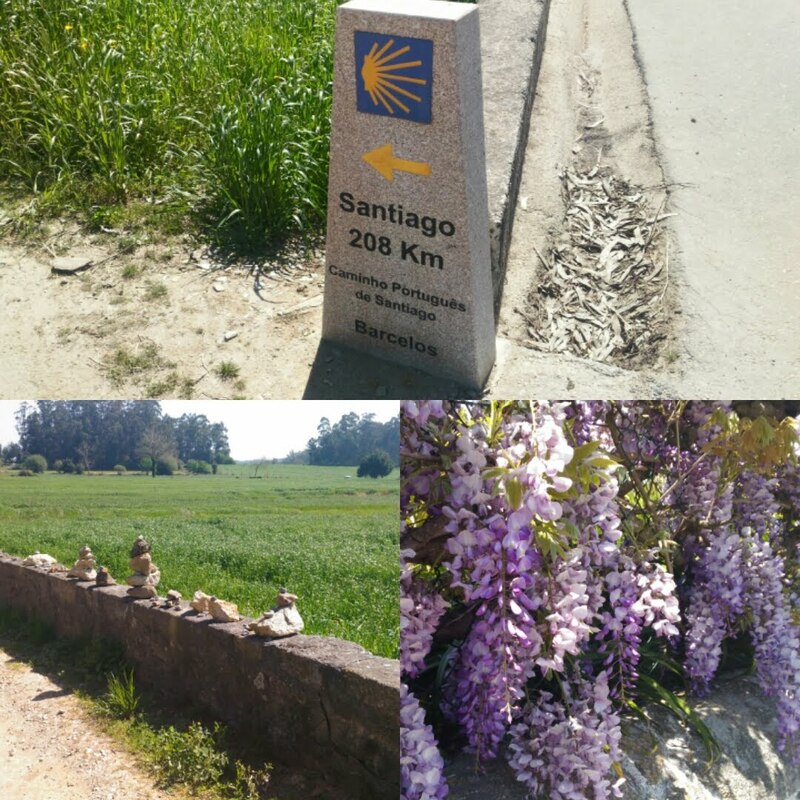 The next available spot is either the municipal albergue half km further or expensive hotels at the 6 km mark. The German mom and daughter will be there. I think 6 km is too close as it is practically the suburbs of Santiago. The Danish mom and son came in an hour after me. Meanwhile, while resting having a drink outside Olivier passed. He said he was crying (intense joy) earlier. 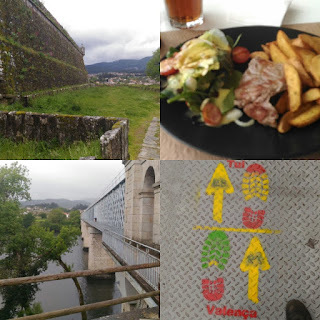 The Camino can sometimes do that to people. 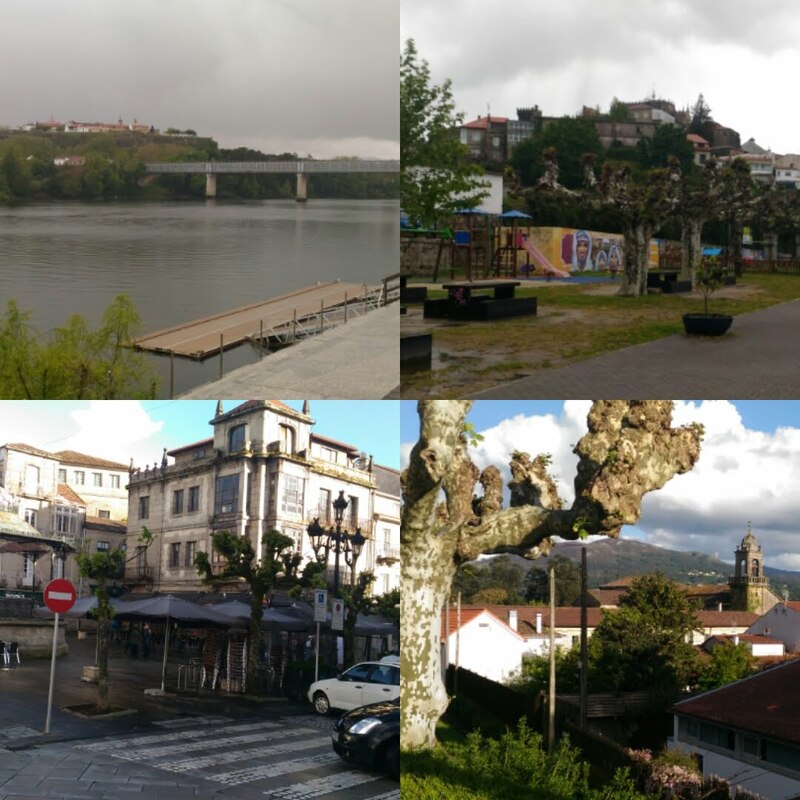 He stayed yesterday at Caldas de Reis and hated the rain, his lodging, the town. The rain yesterday was like in Brittany and I joked that he had come to Spain to get the exact weather as back home. The misty sticky kind of rain that gets in everywhere. He said he had to walk fast ahead of the other walkers, poor guy. He wants to be in Santiago today, that will be past 40 km for him. Maybe it is for the best since he is already in an emotional charged state. 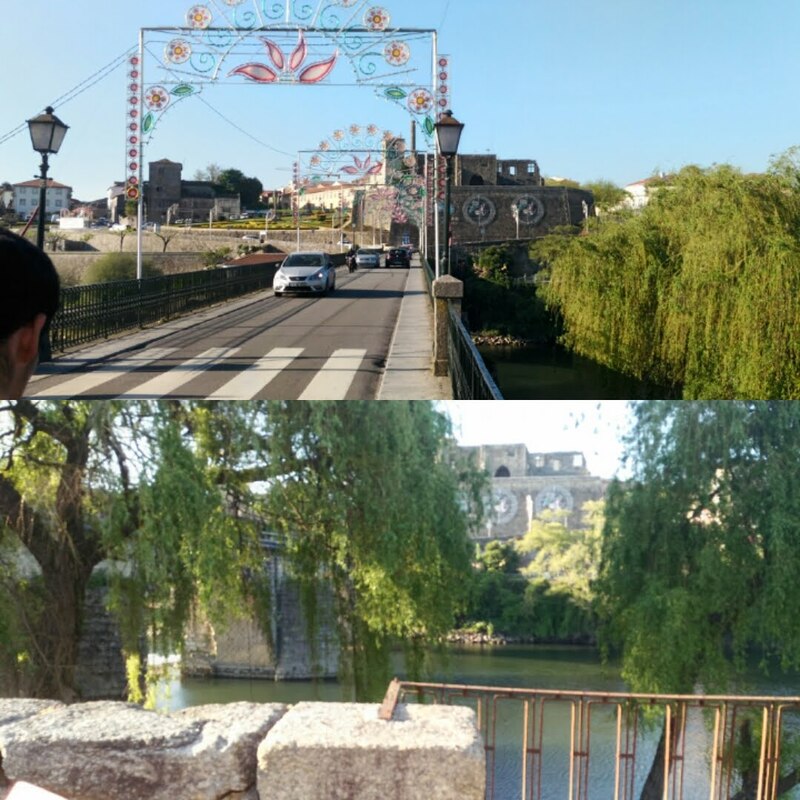 For me the first 10 km to Padrón today was absolutely great. Nobody but me along the route. As long as I stayed between yesterday's and today's horde, I don't see any crowd, and just a pilgrim here and there after Padrón. 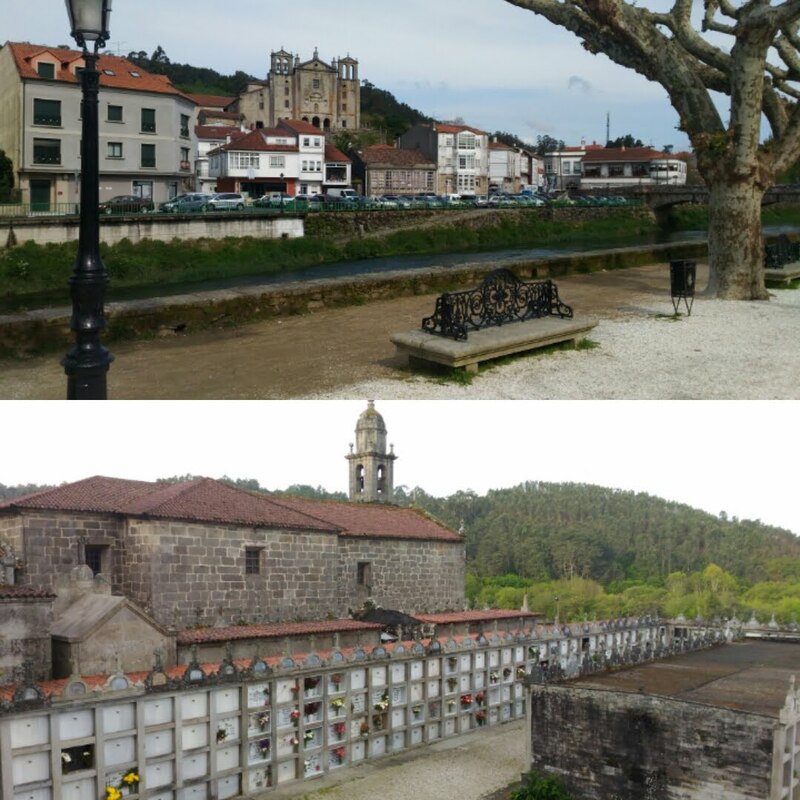 In Galicia the cemetery are always with the church and stacked like multi-layer bunk beds. Had some food at a weird establishment before Padrón. Hippie style with pressed coffee the owner was very proud of kimd of crappy for me. He said he sourced it from Brazil when he was travelling there. Just eggs, bread with some salsa type sauce and he wanted 6 euros. Too late back.off. It was a wise strategic decision yesterday. Doesn't matter anymore tomorrow with just 13 km to go. Half of that distance will still be nice walking at least according to my map. 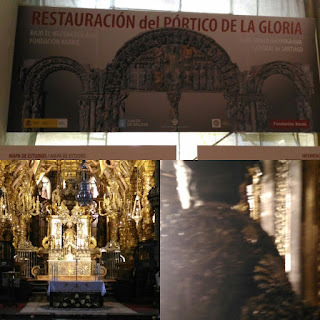 Padrón which I passed at noon was allegedly the place where the stone ship carrying St. James landed if you believe the legend. How his body was discovered coincidentally 700 years later in Santiago de Compostela right after Spain was overrun by the Moors and he became the inspiration of reconquest seems mighty suspicious. This is one of the disciple of Jesus we are talking about. Still, the historic, religious, cultural, political and military impact cannot be undermined. 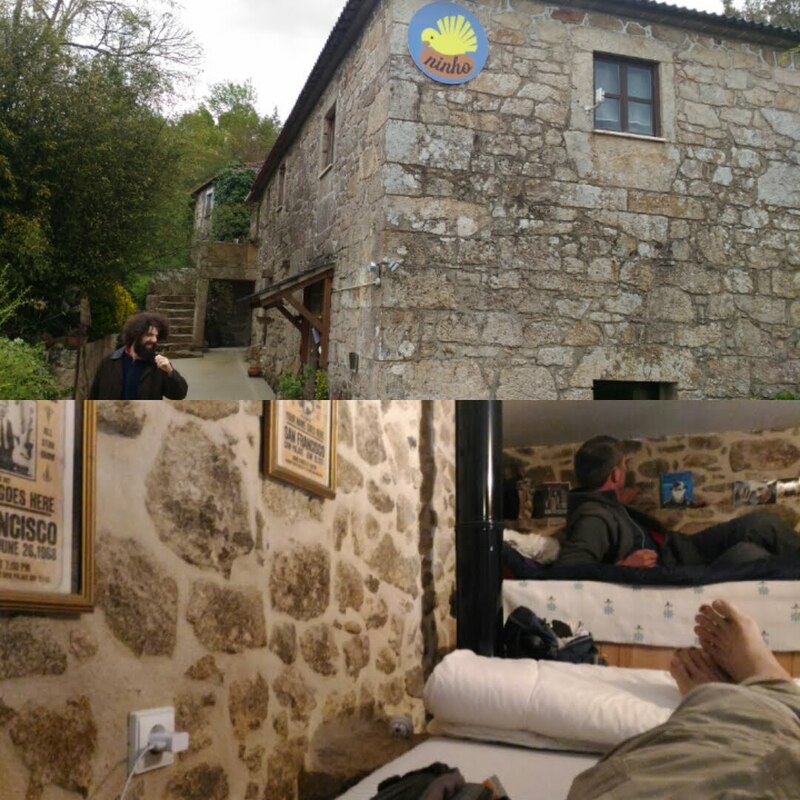 Pretty soon this private albergue was packed (at least in my room with 12 beds) and more in the next level. Mainly Germans speaking pilgrims (they seems to know one another), the Danish mom and son William and Elsbeth and an old Dutch couple in the late afternoon. I am going to have an early dinner (just the lady who runs this place cooking) and retire. So cold the wind and the stone building albergue, the outside temperature barely rises above 12 degrees. 27 km. It rained the whole day and even into the early evening. The weather for tomorrow is supposed to be clear. 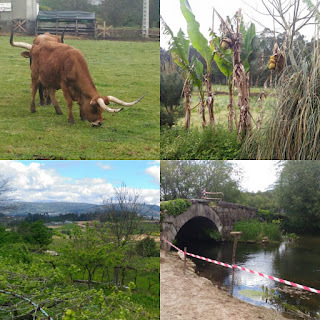 Didn't take many pictures today, also due to the wet weather. 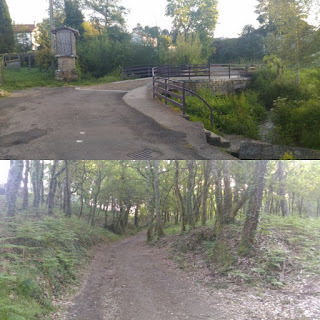 Maybe a typical stone bridge crossing a stream which is typical here in Galicia. 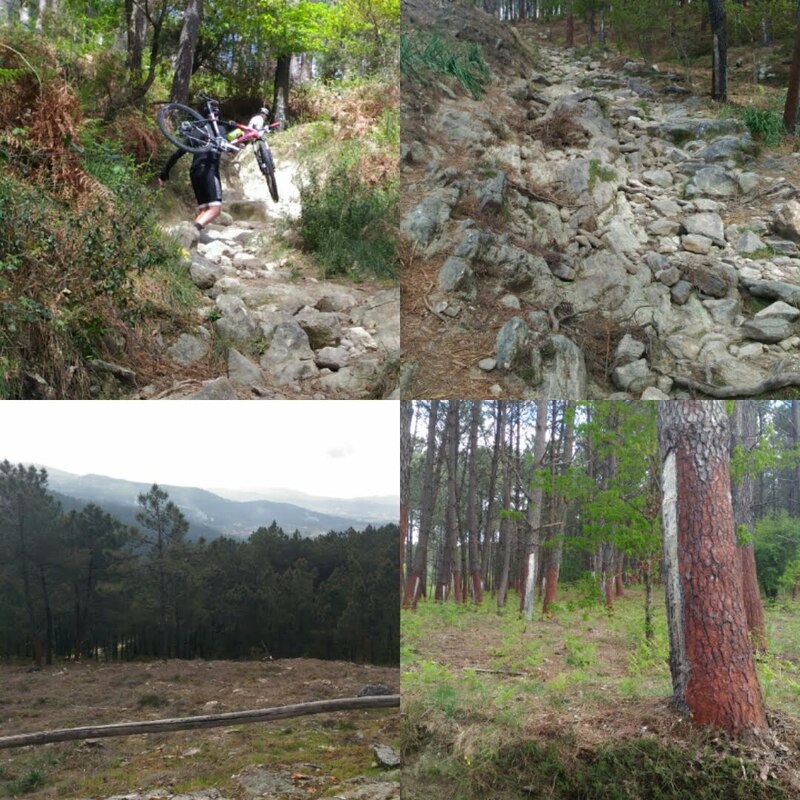 With so much rain in Galicia they are well versed in engineering their path and crossing to minimize muddy trails. Today's stop at Caldas de Reis at 22 km is a bit short, and to beat the crowd I decided to go further. 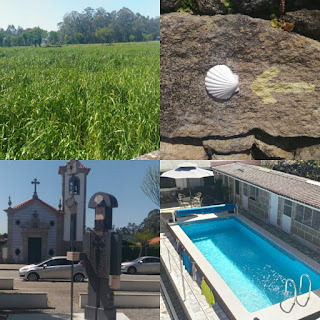 It would be best to add another 8 km but the only place is 5 km at O Cruceiro. The rest are either too far or municipal albergue. At Caldas de Reis I went into a phone shop to get a Spanish SIM as my Portuguese one had been dead for the last 2 days (no roaming?). The Spanish one (1 Gb), 5 euros. Nice to be connected even when walking. Took a long time for the lady to register with my passport. In Portugal they didn't even asked for my identification. Even more important job for the new SIM is to make a call ahead to the hostal 5 km further to make sure they have a room. 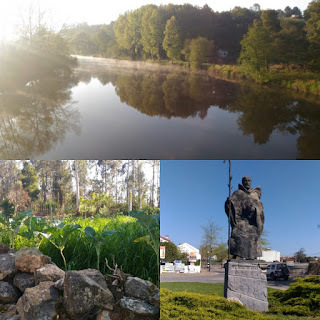 If not, I would have to stay in Caldas. Yes, they have. My plan had work. This way I will also miss the horde of pilgrims walking the standard stage tomorrow. Even the weather helped today as the rain has delayed most of them to start walking this morning. I had encountered few pilgrims this morning. The 5 km after Caldas de Reis after 1 pm I only crossed path with only 2 ladies from Germany. They ended up in the same hostal as me in O Cruceiro. In the evening I chatted with the two ladies before the late dinner at 8 pm (ah, Spain). 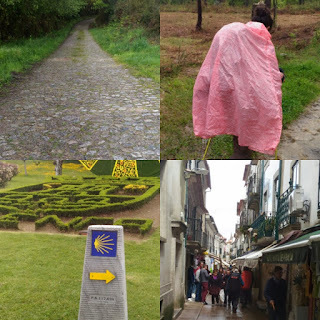 They are mother and daughter walking the camino. I told them about the Danish son and mother walking and in less than 5 minutes William and Elsbeth appeared. Talk about coincidence. They had ended up in the same hostal! The five of us eating our dinner together. 30-31 km. Long day. Problem with sleeping in a municipal albergue is the number of people in the room . It's bound to have a snorer or two, maybe three (above me). At 6:30 am I couldn't take it anymore and started walking before 7 am. That's the cost of not staying at a private albergue with just a few people in the room. Or a solo room for more (that I will reserve for Santiago and/or the day before). It's not that I have a choice at Mos (the municipal.albergue is the only choice there). I should have walked the extra 9 km to Redondela instead. All is not bad though, as by doing so I missed the crowd of pilgrims today walking the last 100 km, first with the early departure then after Redondela only the back markers. Like Camino Frances the last 100 km has many what I called Tourgrims. Those that walk with little or nothing (all their stuff are send to their end of day hotel). Have to pay for such luxuries, but then it is only 5 days' worth. So bloody cold in the morning (just a few degrees) when I started walking so early around daybreak. Had my hoody on to keep as much heat in as possible. By 11 am it is warm enough to drop both layers and walk with only one layer, but still needing to be indoor at the cafe stop. Spring is late this year. Sigh. 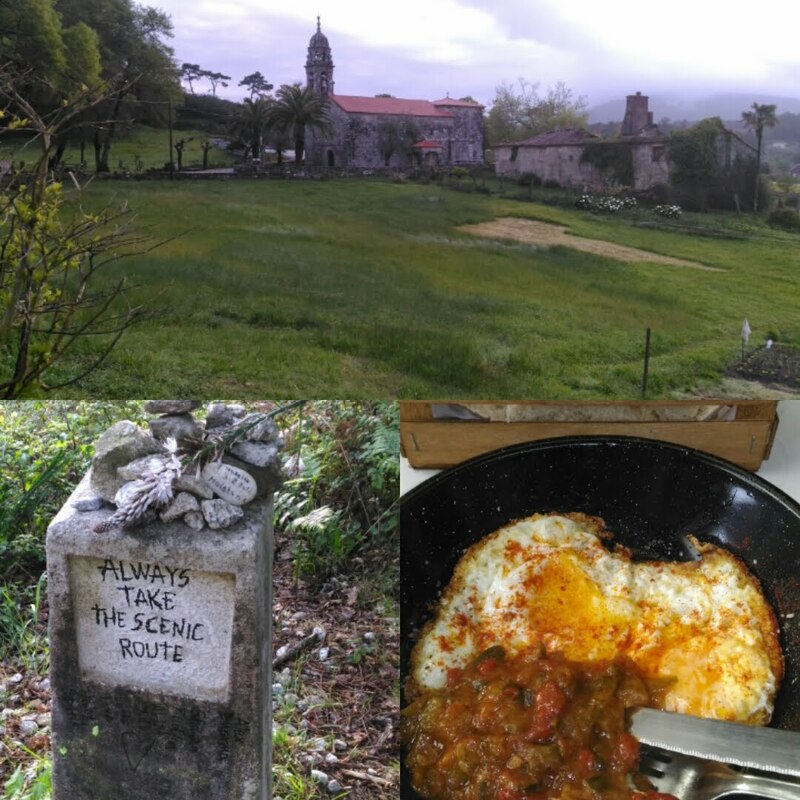 Breakfast 3 km before Redondela at a cafe/private albergue. 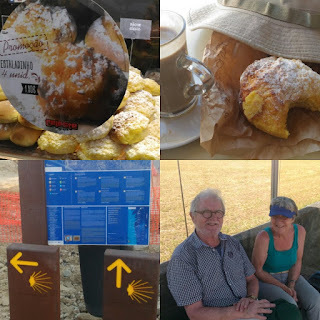 If I had known I would have walk just 6 km more yeaterday as the two (German and Dutch) at the cafe having their breakfast said that they were the only two. Too late for me. The walk in the cold daybreak I saw two interesting animals. A cat that pops out from the village vending machine bottom hold suddenly (could be warm in there). 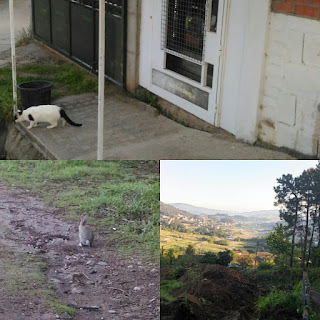 A solo rabbit (reminded me of the horde of rabbits after Valencia on the Camino Levante). 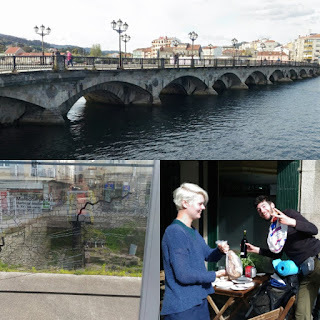 After Redondela and mid-point to Pontevedra is the bridge in Arcade. 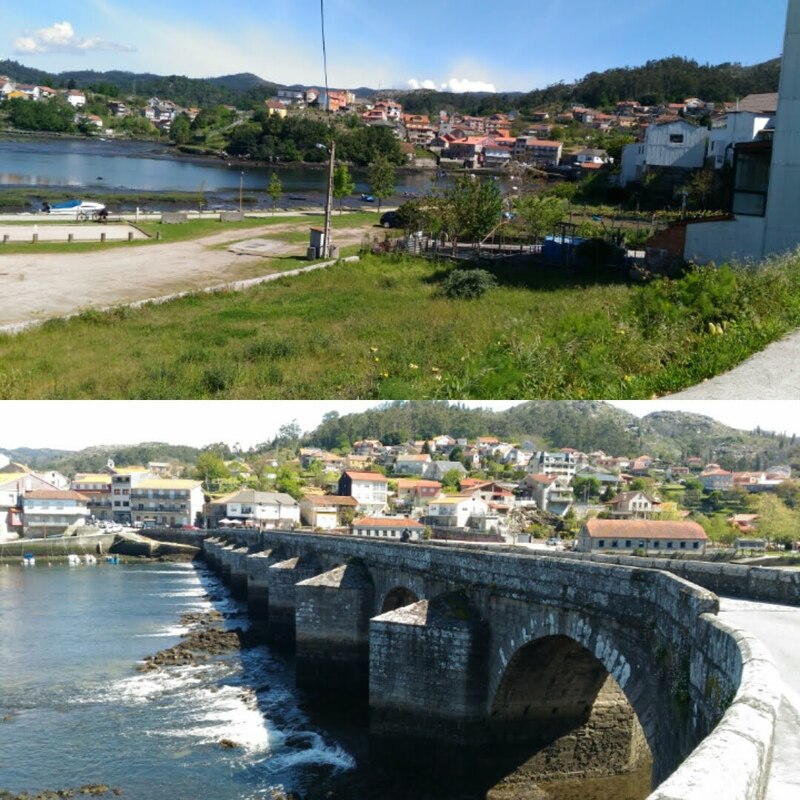 It's the end of one of the five fingers of land in Galicia, one of them being the Cape Finisterre where some pilgrims walk for another three days after Santiago to visit the end of the road/world (before Columbus). Finally in Pontevedra after 3 pm. Saw Josie from Canada. She booked herself earlier during lunchtime a hotel and I helped here navigate there from my maps.me app. 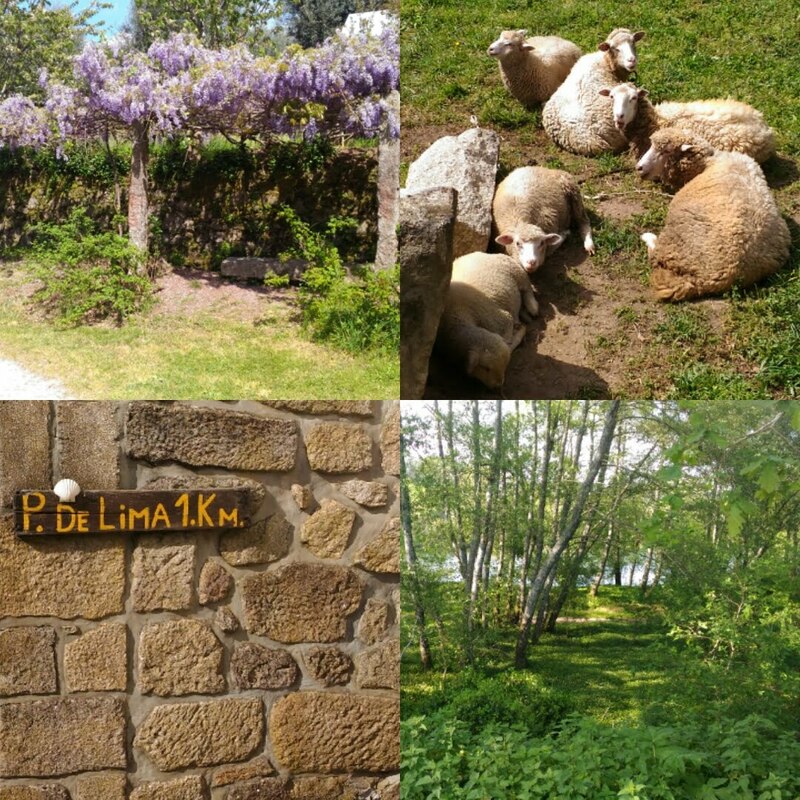 As for myself, I can't see myself booking in advance (also with no cell signal in Spain). I tried the pilgrim hostels/pension from my map overlay. Being late (extra distance today) all the hostels are full except Slow City Hostel (funny name). I got the last bed in their albergue styled room (their private rooms are all taken). 6 beds, 4 russian ladies and an American (here for holiday, but works in Madrid). Funny to be only male in the room. It's not what you think, half of the russian ladies are the type that can pinned you down in a strangle hold in a second. While looking for dinner bumped into David (Portugal) and Hermione (or whatever is the equivalent in Lithuanian). Met them first at the albergue in Ponte Lima. 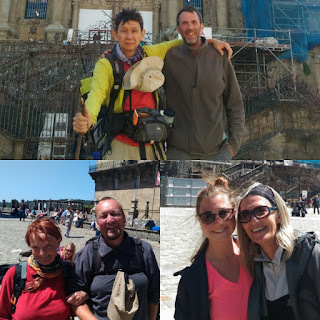 They are a couple doing many trips. David is the one well versed in the history in Malacca and Asia. They offered me some of rheir torilla and told me that the municipal albergue is also full. They probably walk another 8 km as there is another municipal albergue there too. It's going to be late for them. As least they are young and more able. Also Olivier showed up. Not sure where he is staying, he got in early as he started from Redondela today. He complained about the hordes of walkers today and will probably do the same tomorrow as he did today (walk fast enough to get ahead of the horde). I won't have the same condition or luck tomorrow as I did today as my pace cannot be fast due to my condition. 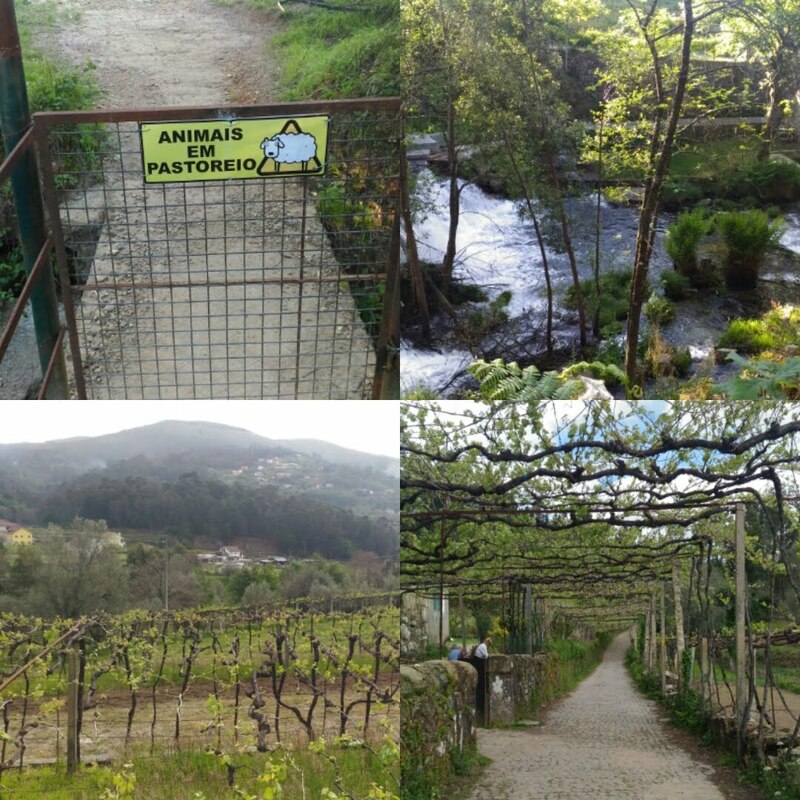 Maybe I could walk longer than the 22 km stage tomorrow to Caldas de Reis. I still won't be able to avoid them on the road tomorrow but at least I may have a better chance of getting a bed if I go off from the standard stage. We shall see. The bridge in Pontevedra is relatively new. The ancient one a small excavated section that can be seen before the current bridge. The current bridge has the Santiago claim shell insignia along the side. I will cross it tomorrow. It's May day (Labor day) today. Day of labor protest here in Europe. I can even hear the sound of car horns and loudhailers while walking in the woods. Shops are not open as it is a public holiday. 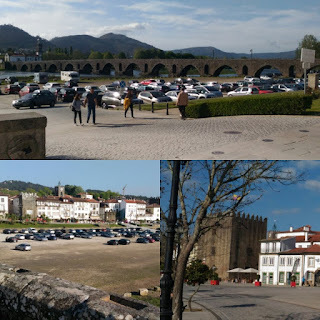 Looks like I have to get my Spanish SIM card tomorrow maybe at Caldas de Reis, and not between 2-5 pm. Ah, the restrictive time in Spain. The hostel has free Nespresso type coffee (the cheaper Nestle variant). And plastic food (Spain has lots of small cheap cakes and bread wrapped up in plastic for breakfast). That should provide me with sufficient fuel tomorrow morning for an early head start (unlike the 6 km today with no coffee and leftover raisins and nuts). The things you do to have a decent last 100 km walk. I think around here it should be around 60 plus km more?